If there is a highway to hell and a stairway to heaven is that an indication as to the expected traffic flows? That particular example? What was on it? 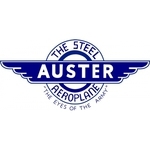 The Auster should be recognised for what it is: a gentleman's aerial touring carriage and a nice aeroplane. Nope. Definitely not connected with Fred Lucas. there are not Avengers in his logbook. And after the war ended he was flying as a civilian in Queenstown. Baz, yes that particular Anson wore a Disney character, like most of the school's aircraft did when at New Plymouth. Could there be in some way a possibility the Museum could repatriate the Chatham's Sunderland back to Wigram? Now I know some of you will say, 'there is no space', 'Whats the point, they have a Catalina. But VERY VERY few Sunderlands survive and this is probably the only ever opportunity to save this old bird? The Ferrymead guys need F-27 bits, so maybe a deal could be struck to bring NZ4111 home, this would free up space to put the F-27 into the shed with all the other farm equipment. I noticed there was more than the rear fuse sitting outside, it looked like a pair of flaps as well. Anyway, imagine a Sunderland fuse displayed. Steps in the back end where the tail section attaches and walk through and exiting out the fwd left door? THERE.....problem solved for an awesome walkthrough display!! I think Wigram already has parts of her in storage. This could be a Win (save the airframe), Win (walkthrough display), Win (bring back some F-27 parts for FAS). The Chathams win as it tidies things up and gets the F-27 inside as well as all that equipment? Yeah - what he said....you know it makes sense! Would the Islanders really want to allow the Sunderland to leave though? Well would they care? They obviously care more about the farm equipment than the Friendship. Great idea Ants if only someone at the Museum who can actually make something like this happen gets on board. And there are only three complete Sunderlands worldwide (with Kermit Weeks more civilian than military) and would nicely fill an important wartime and postwar gap in the Musem's collection. Lets hope someone at the Museum will read this and do some enquiring as to how they could get her here with the F-27 spares promised to Ferrymead? If the Defence Force wont do it (after being nagged) we could set up a "Give A Little Page"? Surely others will get behind this? Remember RNZAF Museum, there may in fact be people on the forum who could help make this happen for you?? They obviously care more about the farm equipment than the Friendship. I guess the farm equipment is more important, it makes the money that pays their bills. The F-27 was never going to be a tourist attraction or money maker for the island. It always seemed a very strange idea that it went there in my opinion. Those wonderful chaps at Tauranga have shown what can be done with a corroded Grumman Avenger hulk. Perhaps they could be persuaded to do some work on the Chathams Sunderland hulk if it could be shifted to Tauranga, then after tidying it up, it could be moved down to Wigram? If you aren't living life on the edge, you're taking up too much space! Just a few points here folks. 1: "who paid for the building"...Answer the locals did, so what goes in it is their call. 2: "what right does the RNZAF have to the Sunderland"...Answer None they stripped out the components they saw fit after the prang and then abandoned it to the locals on what would be termed gratis basis. The aircraft now has spent more time on the Islands than it ever did with the RNZAF and so potentially means a lot to them in local terms. So the presumption that the RNZAF has some greater right, moral or otherwise, to the aircraft is akin to that that they have to go and repossess other peoples' aircraft just because they were once RNZAF and the answer to that again is none. (Consider poor John Smith and his Mosquito which was sold off as basically junk but now that time has moved on and it has value it is seen in some peoples' opinion that it should be RNZAF/Wigram material and he's continually badgered on that basis). 3: Don't muddy the water of the views on the Sunderland with the F27's situation as their only relationship is that they are both on the Islands. I suspect that the Islanders have a greater affinity to the Sunderland given the longevity of its time there than the F27 and also have to suspect that given that Gary Downs has apparently gone then they don't give a toss about the F27 and perhaps think something like "to hell with it now, we only went along with it because he wanted to". I could be very wrong here and apologies to any party if so but its an often event that various museums get an item and then there's a change of view/philosophy/management/personnel and so it's no longer wanted. Consider BXG's history of going to RNZAF Wigram and then Ashburton and don't forget the time she spent outside at those places when you're critical of BXI's situation, other people also had space but F27's don't seem to merit it. I don't even know whether they have internet in the Chathams but I'd love to hear the views of locals about both airframes if anyone there is reading this thread. I suspect Denys is probably right that the Sunderland has a lot of meaning to a lot of people who live there and have grown up there with it as part of the landscape. Otherwise it would probably not have survived this long. I'd hate to see some outsiders suddenly demand the aircraft leaves the island against any local wishes if they do have an attachment to it. It would be like those Aussies who decided that a Canadian Lancaster had a better future in Australia in their own derelict aircraft collection, despite what the locals might think. Thankfully that never happened. Plus would the Air Force Museum even want it? It's a lovely dream to think of the fuselage restored to pristine condition and on display even only as a fuselage, but words that come to my mind are legal ownership, retrieval, transportation, storage space, budget, restoration and preservation. If the museum is happy with all those words, I'd much rather they brought back the PV-1 Ventura from the Pacific than half a Sunderland. Yep, all valid points indeed! And none I can argue with. I am of course assuming no one wants the Sunderland, which may indeed be untrue. At least for now she is partly under cover. Dave, I tried tirelessly many years ago as you remember discussing the PV-1 with Phil Goff and his PA. Elections were coming and they thought the recovery would be a brilliant PR stunt considering the Skyhawk debacle. Many discussions were made and Goff's offices said they could get it passed through parliament (being that it was between 2 different countries)and apparently the AirForce agreed to recover her. They (Govt Offices) tried several times to discuss with the RNZAF Museum but got no reply. Finally I got a Ph call from Phil Goff's offices saying the Museum didn't want it as they already had a Hudson...... Elections were only a few weeks away now and there was no point pursuing it. I know this happened a long time ago and different people were involved than today, so PLEASE no smear on the Museums current directors etc. I mentioned the RNZAF Museum as it might be a solution to their display idea? Good PR. Perhaps Tauranga? Of course you are right Den, the RNZAF Museum have no right to it now, its up to the locals, and if they want to keep her, then the discussion need go no further. Yes the PV-1 will rot away. Why did Goff's team not approach another museum if it was all teed up and ready to retrieve. Bloody criminal to just drop it and leave the aircraft there. Some of the other museums would probably have leapt at the chance to get it home. It really pains me to see the PV-1 Ventura just sitting there at Talasea, rotting away. Regardless of the air force museum wanting it or not(crazy not to get it), if it is available surely it could be brought back to NZ and stored somewhere.Its not going to be in a worse state than currently,and at least has the option of being restored later.Once its gone,its gone.